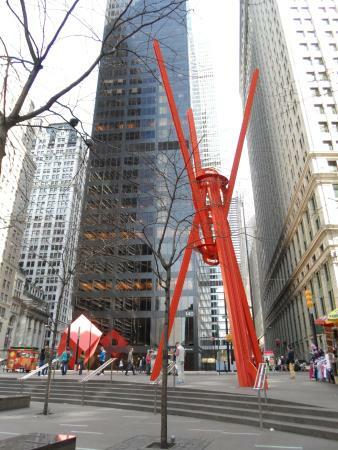 You will begin in City Hall Park, where you will meet your tour guide and be introduced to some of the area’s history and its iconic buildings, such as the Woolworth Building and City Hall itself. Soon, you will be on your way to the World Trade Center. Your first stop is St. Paul’s Chapel, known as the “Little Chapel that Stood”, as it survived relatively unscathed, remarkable due to its close proximity to Ground Zero. Still an active chapel of Trinity Wall Street, you will hear stories about how this structure served as a refuge for exhausted recovery workers and as a memorial itself to both the victims and emergency service personnel. 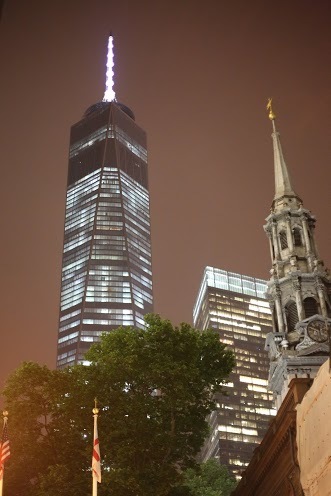 From its graveyard, you will be afforded an excellent view of One World Trade Center (a.k.a the Freedom Tower). From St. Paul’s, you will be lead into the Oculus, the centerpiece of Lower Manhattan’s new transportation hub, and replaces a previous station destroyed in the terrorist attack. 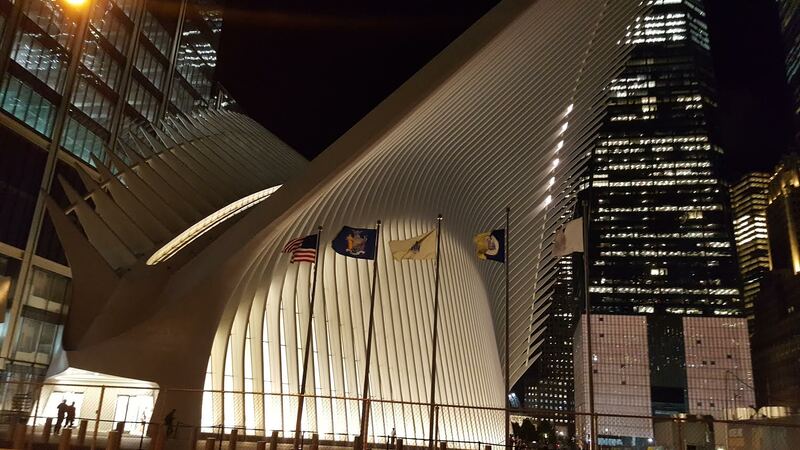 Designed by Spanish architect, Santiago Calatrava, the Oculus is certainly an impressive structure, both inside and out. 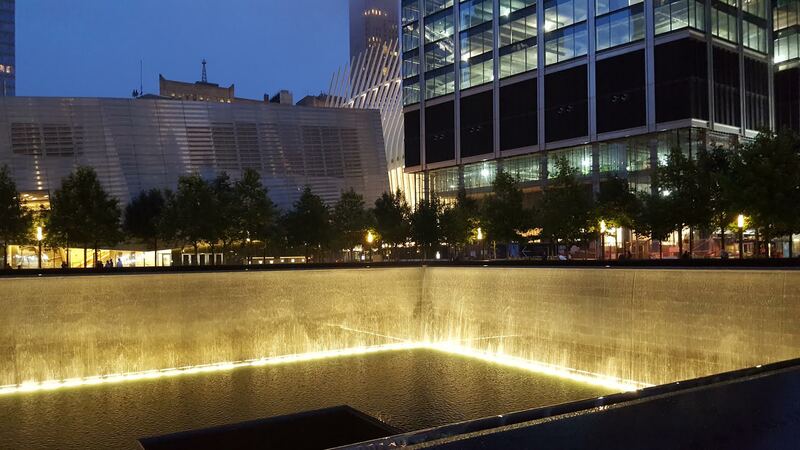 Your tour will next head to Ground Zero and the 9/11 Memorial Pools, formed from the excavated pits of the former Twin Towers. 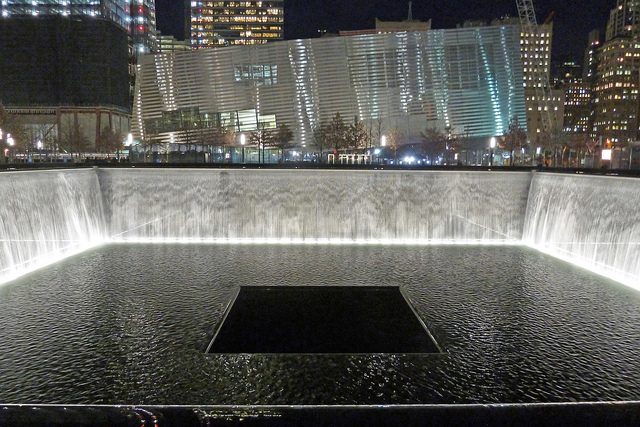 This moving memorial has a different feel at night than during the day. Here you will learn not just about how the memorial came to be, but also how the integrated new World Trade Center came about. Although we can’t enter the National September 11th Museum, you will also see this distinctive building and learn more about what it contains. The second half of the tour covers the Brooklyn Bridge. At over 150 years old, this bridge is one of the world’s iconic man-made structures, connecting the boroughs of Manhattan and Brooklyn and stretching just over 1 mile (1.6 km). This bridge has so many amazing (and tragic) stories, and you will hear about some of them on this tour. 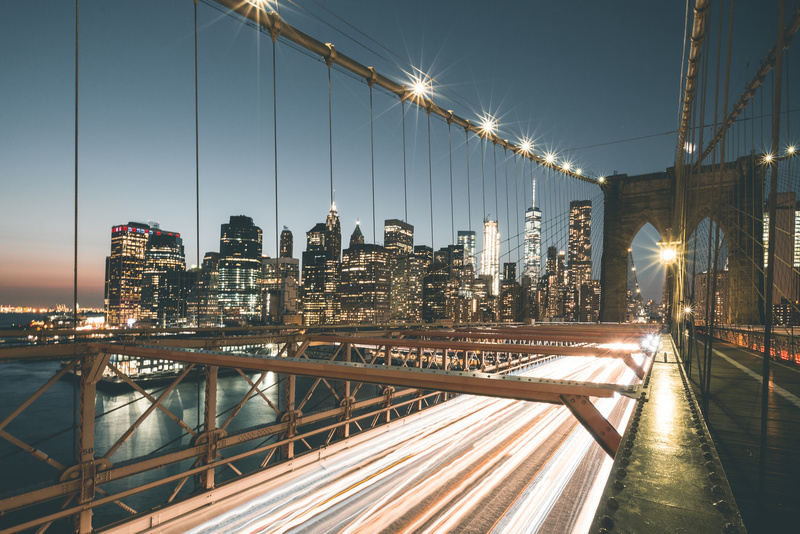 However, as interesting as the stories of the bridge are, you are likely to be as captivated by the views of New York City’s skyline and harbor all lit up.